A meditative collection of short, accessible memoirs documenting the meaning of clothing. 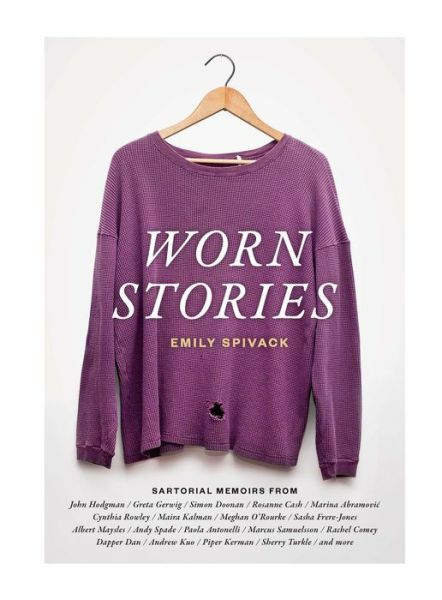 Emily Spivack’s fascination with the past lives of clothing led her to create a website, wornstories.com, on which she collects “sartorial memoirs” from friends, family, acquaintances, celebrities and everyday strangers. Now her book, Worn Stories, assembles those accounts. They are short, and generally recorded as told to Spivack but are occasionally written by the contributor. Each brief narrative is accompanied by a photograph of the item, against a white background, adorned at most by a clothes hanger. The text describes how the speaker came to own the article, or what took place in and around it that made it worth keeping–sometimes for decades. A dress, a pair of shoes, a hat or accessory conveys an emotion or an experience: love, loss, accomplishment. They may symbolize a place or a time in a life, or remind us of what we don’t want to forget. These vignettes are at turns hilarious (humorist John Hodgman’s long-sought Ayn Rand dress or trucking manager Pamela Jones’s party dress), silly (reporter Jenna Wortham’s sequined top) and poignant (creative ambassador Simon Doonan’s Lycra shorts or writer/bartender Kelly Jones’s tie-dyed wrap skirt). Some have historical significance: Holocaust survivor Dorothy Finger had an ill-fitting suit made from a piece of wool fabric that was the only thing she saved from her life in Poland. Spivack speaks directly to her reader only in a brief introduction. The collection of contributors’ reports forms a whole that is entertaining, thoughtful and loving of the universal tales we have to tell about the garments we carry through our lives. This review originally ran in the August 29, 2014 issue of Shelf Awareness for Readers. To subscribe, click here, and you’ll receive two issues per week of book reviews and other bookish fun!